Hello there fellow HeroClix fans! Today we have a special double preview as we take our first sneak peek at the Organized Play (OP) kit for Giant-Size X-Men. We begin our OP kit explorations with Deadpool! It’s great to see Deadpool in his X-Force uniform and he certainly brings an arsenel of explosive one-liners and witty weapons. His dial opens with Stealth (as he sneaks-sneaks-sneaks around), Toughness, and his New Writer special power that allows you to add a little deus ex machina to your games by choosing the power set that will help you out the most during your game. Stealth gives way to Running Shot as Deadpool leaves the comfort of shadows for a full-frontal assualt, while Toughness gives way to some early-dial Regeneration (handy to get back up to those first clicks), and Perplex allows him to add that little bit of extra help where it’s needed most. Deadpool’s late-dial brings Charge and then Phasing/Teleport as well as some Blades/Claws/Fangs to the battlemap and Regeneration makes another appearance as well. However, if Regeneration isn’t sufficient to get Deadpool’s dial to where you want it, there’s always his X-Men team ability which allows you to share clicks of health with other figures with the team ability. Lastly, Deadpool’s trait allows him to ignore the effects of Poison, Mind Control, and Penetrating/Psychic Blast. Combined with consistent combat values and a great power selection, Deadpool will make a very useful addition to your next X-Force! 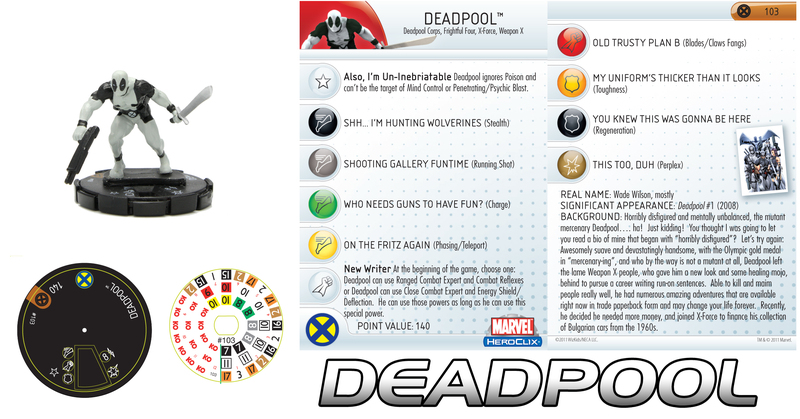 Next up, we have Deadpool’s (hotly anticipated) teammate, Archangel! Archangel joins his X-Force comrades striking from the shadows with early-dial Stealth. If your opponent tries to base Archangel, their figure must then contend with Warren’s Combat Reflexes and Quake, hardly an incentive to engage in close combat! Archangel’s mid-dial gives him access to his Razor Wings special power which allows Archangel to use Blades/Claws/Fangs while using Hypersonic Speed. Combat Reflexes gives way to Toughness as Running Shot and Incapacitate demonstrate Archangel’s paralytic “move and strike” techniques. Finally, late-dial Regenerate and the X-Men team ability allow you to continually get Archangel to where he’ll do the most good. 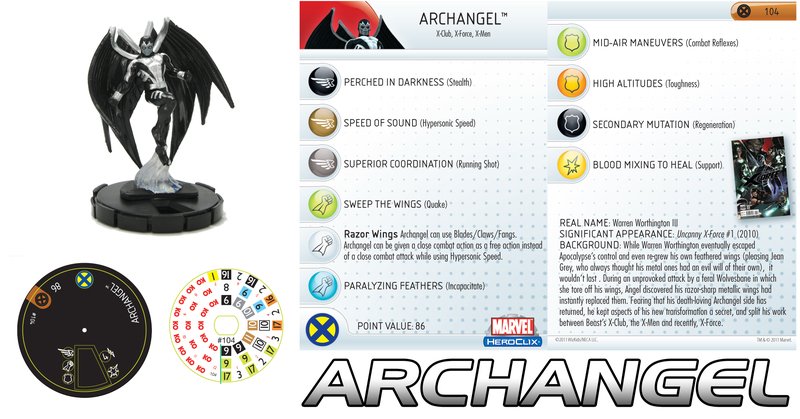 With proper planning, one can almost always manipulate Archangel’s dial to the most useful spots at any given time! With the countdown to just over a week, we’ll be bringing you more X-citing OP elements in the days to come. Be sure to join us later this week for more previews and join us in anticipation to the release of Marvel HeroClix’s next great expansion, Giant-Size X-Men!